Last Sunday afternoon I headed over to Old Town. I wanted to see the 64th Annual Las Posadas, the reenactment of a centuries old Mexican celebration of Mary and Joseph’s journey to Bethlehem. Unfortunately, with my limited phone camera understanding, the darkness and other factors, my pictures of it turned out awful. 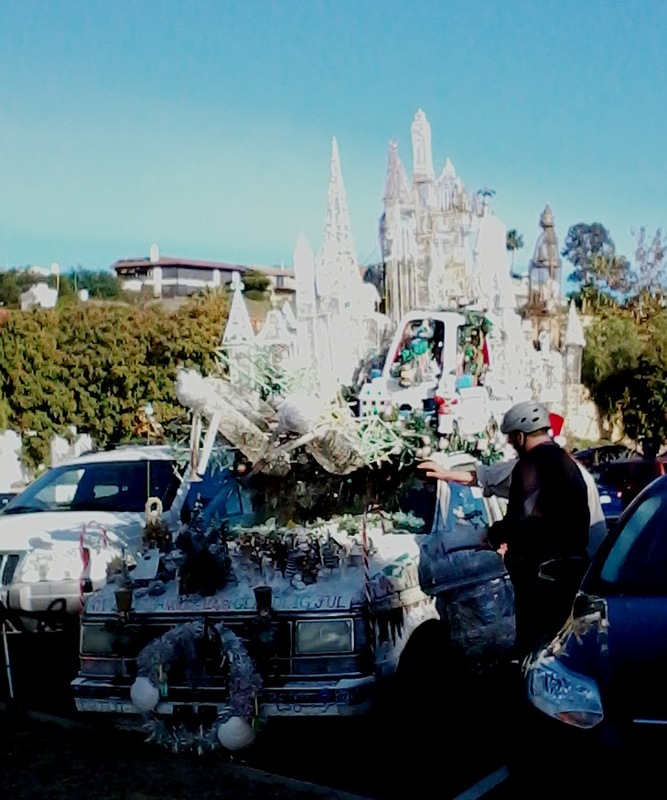 But I do have some good photos of Christmas decorations spread around the area. The procession didn’t start until 5:00 and I got there at 2:30 so I had plenty of time to wander around. Here is a great art car that I spotted on my way to the Old Town Historic Park area. 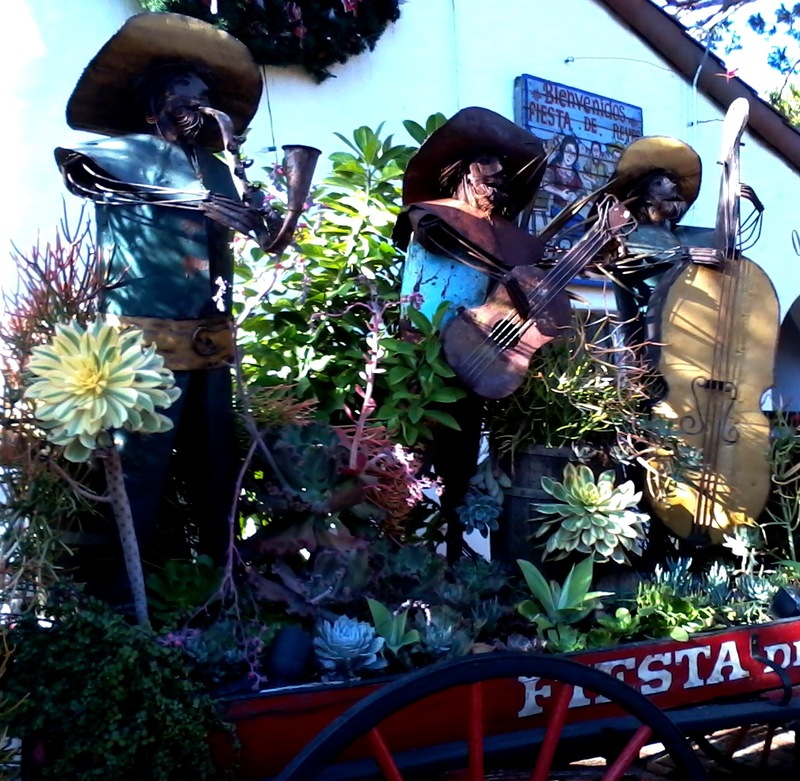 I started in Fiesta del Reyes, an area with shops, restaurants, and a small stage for music. The online schedule had listed a children’s choir and carols but instead there was more traditional Marachi music playing. I enjoyed stopping to eat a small bag of freshly roasted nuts, sitting and listening to some music and wandering through stores. Here was a sculpture welcoming me into the area. 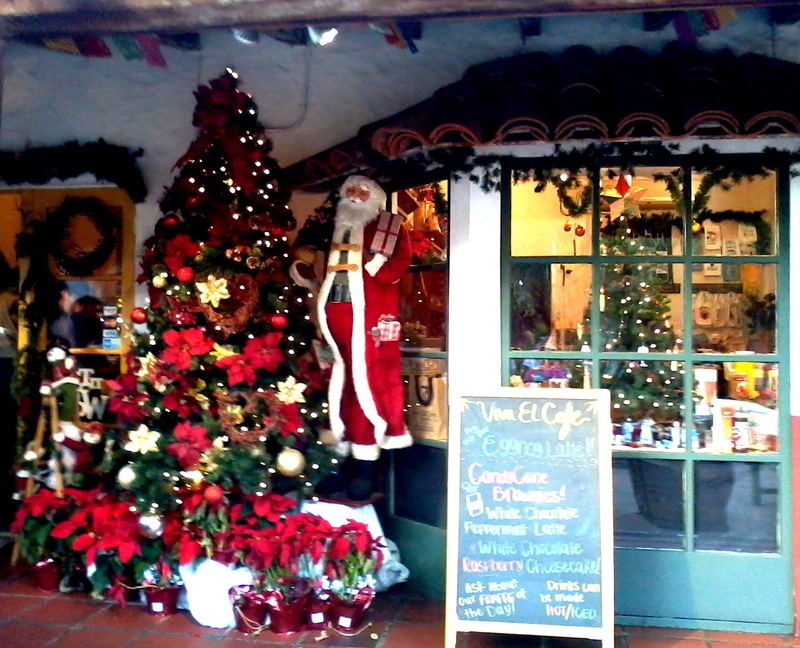 And this lovely display in front of a small cafe and a gift store. I ended up having a lovely conversation with a woman whose ancestors had lived in the old homes in the Historic park. I have long felt connected to this place so it was wonderful to meet this woman who had grown up hearing stories of her ancestors settling this town. 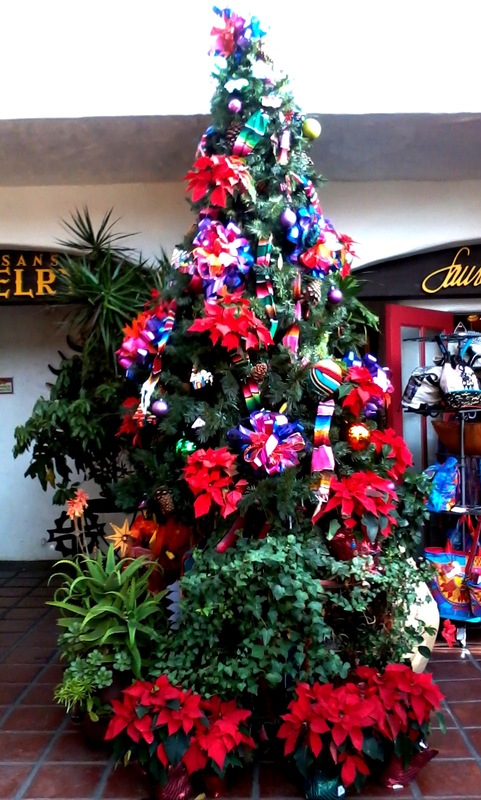 Next I headed across the street to Bazaar Del Mundo Shops, where there were several trees in stores and in the walkways. 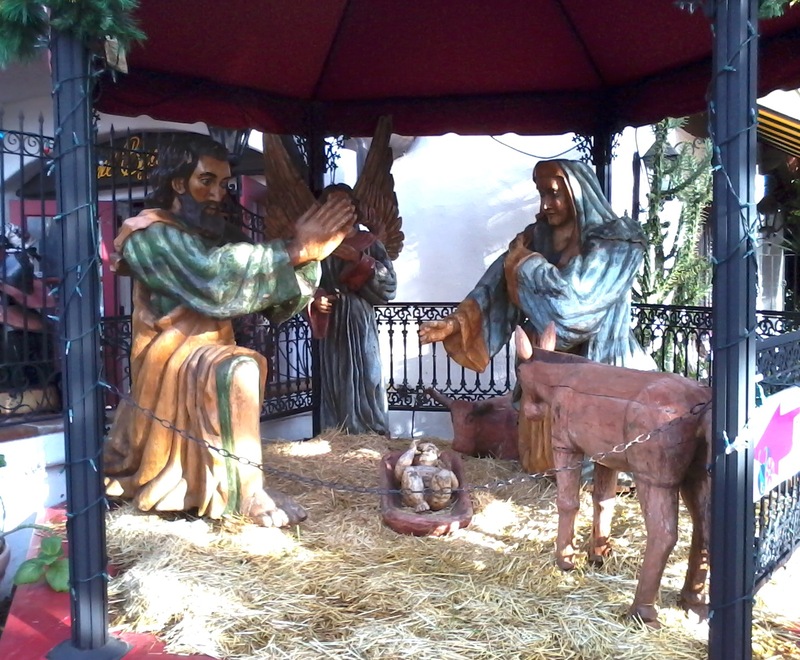 At the entrance to the shops was a pretty nativity scene. 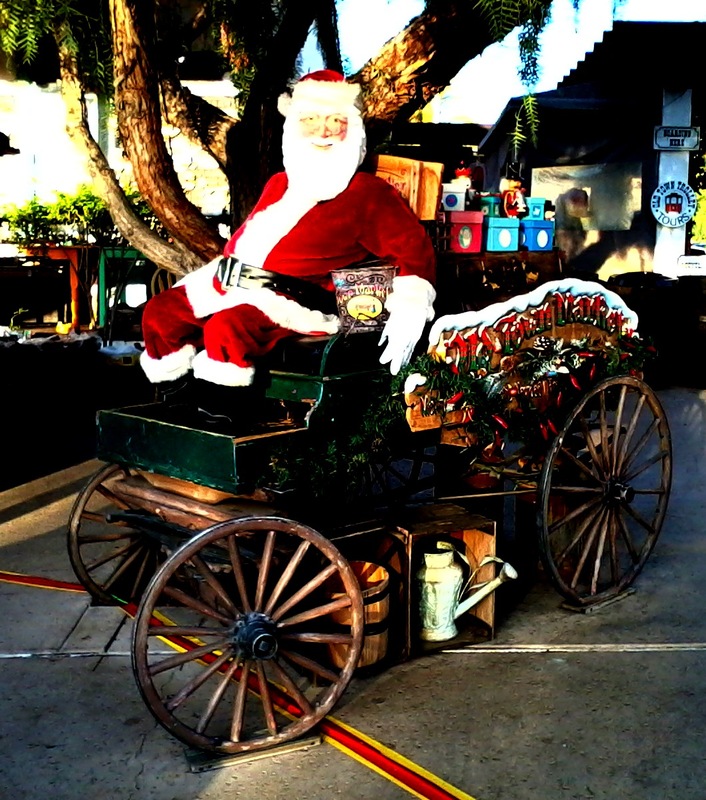 After leaving the Bazaar del Mundo shops I headed back to the Historic Old Town park and found a great Santa on a sleigh and a sweet Christmas tree. I was led to the Immaculate Conception Church, which I had passed before but never entered. 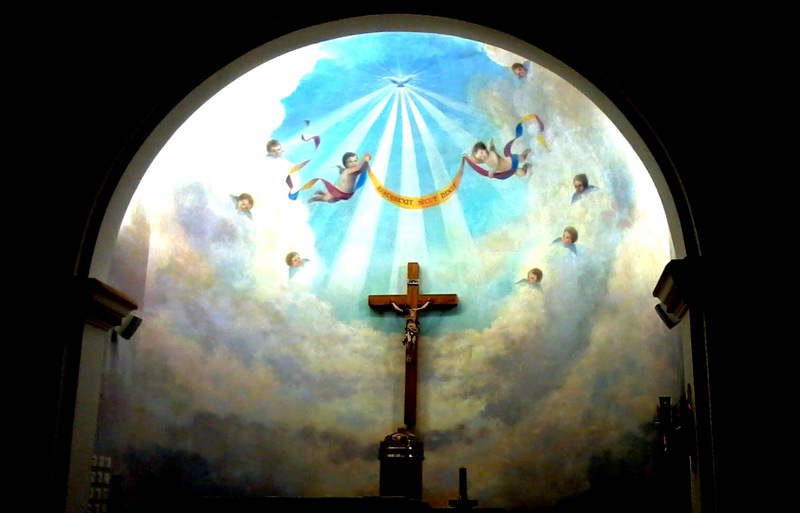 I took a moment to light a votive candle in the front of the church, then I went around the side and found the door open so went inside to find this beautiful altar painting and to pray for light and love to finally cast out all darkness in our world. 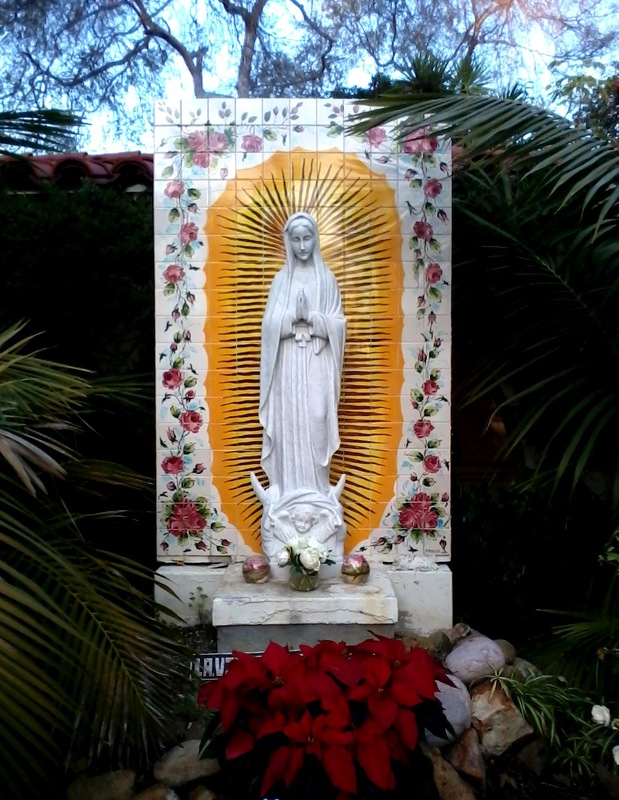 To the side of the church I found this sweet Mother Mary altar. 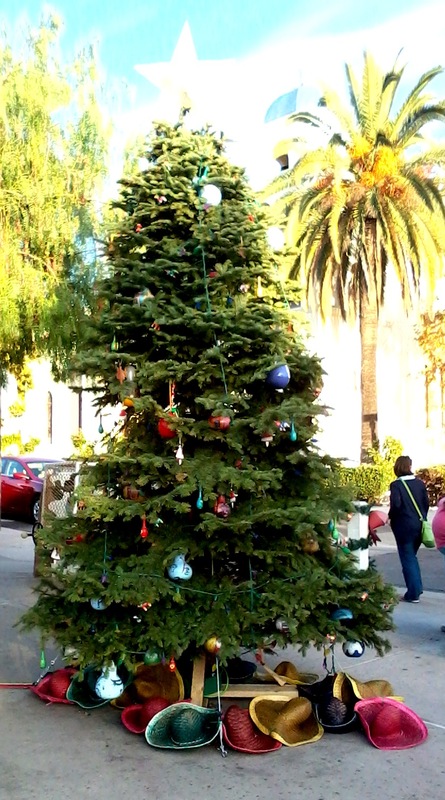 Finally, I ended up back at the Historic Old Town park to wait for the Las Posadas to begin. I had a little time left, so I went and grabbed 2 great street tacos. Yum!!! 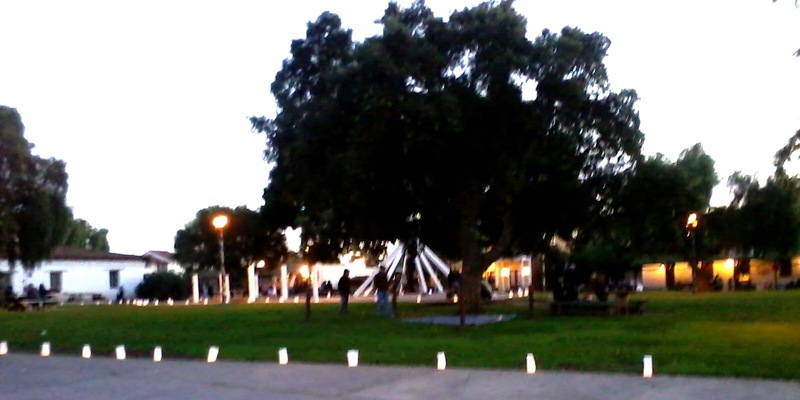 Before the procession started, they set up luminarias around the plaza. So here’s a picture of those. The procession itself was lovely and lively. Mary was on a donkey, Joseph led the way and Mary and the donkey were accompanied by a few other figures. There was a large group in the procession, carrying candles, some singing, as they accompanied the procession from near the old print shop, around the plaza and back to the east end of the plaza. Every once in awhile, Joseph would stop and call out to a proprietor of an inn, having a conversation looking for lodging. The conversations were a combination of tongue in cheek and reverence for the sacredness of the journey and quest for a place for Jesus to be born. Obviously, it was 2014, in the US, among a reenactment but at times I would crane to hear whether there was indeed room at a particular inn, excited to be part of this sacred journey of faith and Mary and Joseph following the guiding star to the place where Jesus was to be born. When they were welcomed to the stable, I had tears in my eyes 🙂 A woman dresed up as an angel, sang a Christmas song, and then a local choir sang a few more songs. I didn’t stay on for the following pinata or bon fire, but it looked like a lovely evening with many families in attendance. Hopefully you can come and enjoy this great event next year! Many blessings to you and your loved ones for a joyous and peace filled Holiday season, no matter how you celebrate the holidays, or which ones you celebrate!